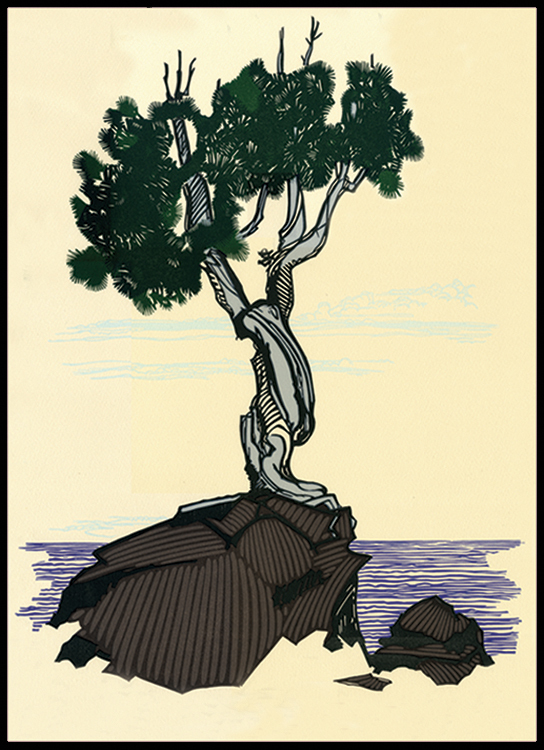 The Spirit Little Cedar tree drawn by Kent Aldrich of the Nomadic press, 2007. The town of Grand Portage, platted on a bay off Hat Point, marks the starting point of a path to the Pigeon River that bypasses a twenty-mile stretch of the waterway containing High Falls and impassable rapids. Before the voyageurs arrived and gave the site its French name, the Ojibwe used the portage for generations and called it Gitcheonigaming or “great carrying place.” France’s Pierre La Verendrye arrived at Grand Portage in 1731 along with his sons and fifty French soldiers. When the British Northwest Company set up a trading post in the late 1700s, the town became one of the most important fur trading centers in North America. Today Grand Portage sits on land owned by the Grand Portage Band of Ojibwe. Grand Marais’ first settler, John Godfrey, named the nearby Mount Josephine—actually an outcrop of rock thought to be some of the oldest in the world, roughly 1.3 billion years old—for his daughter who, along with some friends, climbed the peak in 1853. Unfortunately, vandals have caused the local band of Grand Portage Ojibwe, who now own the land near Grand Portage where the tree is found, to close off public access to the Spirit Little Cedar Tree. Today those wishing to see the Spirit Little Cedar Tree must arrange a tour with a member of the band. For a distant view, you can take the MV Wenonah from Grand Portage to Isle Royale; it passes by Hat Point to give passengers a view of the tree.